At the annual EDUCAUSE conference this past fall, I had the chance to sit down with F. King Alexander, president of Louisiana State University (LSU), for a conversation on bridging the gap between technology solutions and business problems in higher education. King is a big fan of data’s ability to help educators drive success for their institutions and students. 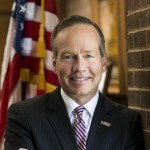 He has extensive experience as a professor and leader in higher education, having served as president at California State University, Long Beach before joining LSU in 2013. What follows are excerpts from our conversation. How do you view the role of technology in higher education? Are you more hopeful or more fearful of its impact in the future? I’m very hopeful. Maybe it’s because my background is a little different from other higher education leaders—I taught finance and policy at the University of Illinois and University of Wisconsin—but I believe data will play a huge role in the future given how much the higher education landscape has changed. We’re now in the business of justifying what we do as universities, and data is absolutely essential for that justification. In 2007, when I was with the California State University system, all 23 of our institutions began to publish data on student loan and debt issues, and career earnings. We did this as a trial to encourage other institutions around the country to do the same. Many people screamed about student privacy issues, but despite that, the Cal State public goods page became the model for the College Scorecard used today by publications like Forbes and Money Magazine. It’s valuable, outcomes-based data that students and parents need in order to make better decisions about their future. What has changed to drive this shift to making decisions based student information and data? I believe the era of “trust us, we’re worth it,” is over. Parents now want to know what value is going to come from their investments. Before recent technological innovations in higher education, people knew more about the used cars they buy than the colleges they invest in. This is only the beginning of the shift. With innovations like competency-based learning and better student systems, it’s about to be a difficult environment for the schools that charge $70,000 a year in tuition. When I talk to CIOs, they tell me they want to be seen as more than the tech person. How can people leading technology on campuses better demonstrate their value? As the CIO or technology leader at your university, a critical part of your job is arming the president with real data and statistics that can influence opinion. The traditional benchmark, the U.S. News & World Report, tends to favor smaller schools over public universities because of the way they weigh different benchmarks. So, what you can do is combat some of this with real data those lists don’t take into account. Students from Long Beach State and Cal Poly have starting salaries among the highest in the country. Why? Because they have a lot of STEM majors, but that’s not something publicized in the college rankings. CIOs can arm their presidents with data to use in legislative discussions. Three years ago I asked my staff a simple question: We know this is our largest graduating class in history at LSU, but is it our largest African-American graduating class? Nobody knew the answer because we didn’t yet have access to that data. So last spring, when we did have our largest African-American graduating class—as well as our largest female and veterans graduating classes—I was able to share that with our governor. This is the type of data we need to change the conversation and drive support for a lot of our initiatives. There’s a lot of focus now on using predictive analytics to help solve retention issues and discover better pathways for students. Do you think this is an area that can help improve student success? Definitely. At LSU we originally thought the hardest-to-retain freshmen would be those with the lowest high school GPA. What we found out, though, is it was the students that had a 3.8 and above in high school, but then saw their GPAs drop in the first semester, who got discouraged and were at the highest risk of leaving after the first year. Now that we know this, we are able to better predict which students are going to need more help, and can mobilize student services and student affairs to provide that support early on. What do you say to faculty that have a “sink or swim” mentality when it comes to student success? There are faculty who assume 50 percent of students will fail, and we are trying to weed them out. This mentality is based on an open-enrollment environment we had back in the 1950s. In that day and age, 90 percent of our funding came from the state and 10 percent from students. Today, 75 percent of funding comes from students and 25 percent from the state. In many ways, faculty’s salary increases are contingent on students succeeding. There’s obviously a moral obligation as educators to make sure students are learning, but it’s also just the economics of the day. The student in the greatest danger of going into student loan default is the one who started college and didn’t finish. His or her lifetime earnings capacity is about $38,000 per year. The earning capacity of a student who graduated high school and never pursued college at all is about $32,000 a year. There’s almost no difference. If you did graduate college, that capacity jumps to $58,000 a year. That’s also a tax revenue issue for the state, because a student is going to be on social programs and on other government-funded programs if they stay at that low income level. The student that makes $58,000 will be paying taxes on those earnings. It’s more important than ever to educate our students and get them through college. A good way to see this in action is through simple, alarming statistics: In the U.S., 55-64 year olds rank highest in the world for percentage of the population with college degrees, but our 25-34 year olds are 12th in world and moving to 13th by next year. In 2020 we will be 19th, behind Bulgaria. That is the biggest single macro issue that everyone has a responsibility to address. We all have this idea that college is this block of time that lasts 2-4 years that you enter when you’re 18 and leave in your early 20s. But now you have students enrolling and withdrawing at different ages, transferring, etc. What does this future student look like at LSU? A lot of people don’t realize that we have three separate regional campuses with a completely different makeup of student from our main campus in Baton Rouge. Most of these students are adult learners who started somewhere else and in some cases didn’t finish. The majority of Americans are in that category. I’m less worried about the traditional-age student, because we will always have those and we know that model of education. It’s all the other students that we need to focus on. We have returning veterans who enlisted in order to get a college education, not to see the world. We also have a high number of Latino and African-American students who need college more than any other population. These students need support, and one way we can do that is by ensuring our campuses are full-service and open year-round. We need to be accessible, affordable, and provide different pathways to all different kinds of students, because everyone deserves the opportunity to succeed.